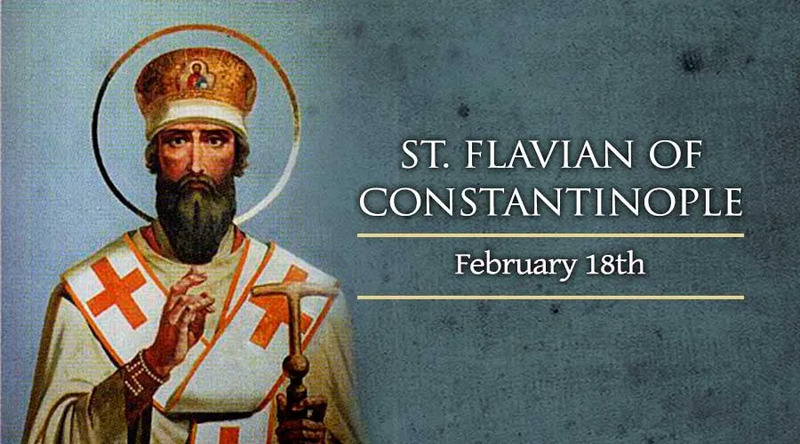 On Feb. 18, the Roman Catholic Church remembers Patriarch Saint Flavian of Constantinople, who is honored on the same date by Eastern Catholics of the Byzantine tradition and by Eastern Orthodox Christians. Known to Eastern Christians as “St. Flavian the Confessor,” the patriarch endured condemnation and severe beatings during a fifth-century dispute about the humanity and divinity of Jesus Christ. Though he died from his injuries, his stand against heresy was later vindicated at the Church’s fourth ecumenical council in 451. St. Flavian is closely associated with Pope St. Leo the Great, who also upheld the truth about Christ’s divine and human natures during the controversy. The Pope’s best-known contribution to the fourth council – a letter known as the “Tome of Leo” – was originally addressed to St. Flavian, though it did not reach the patriarch during his lifetime. Flavian's date of birth is unknown, as are most of his biographical details. He was highly-regarded as a priest during the reign of the Eastern Roman Emperor Theodosius II (which lasted from 408 to 450), and he became Archbishop of Constantinople following the death of Patriarch Saint Proclus in approximately 447. Early in his patriarchate, Flavian angered a state official named Chrysaphius by refusing to offer a bribe to the emperor. The ruler's wife Eudocia joined the resulting conspiracy which Chrysaphius hatched against Flavian, a plot that would come to fruition in an illegitimate Church council and the patriarch's death. As head of the Church in Constantinople, Flavian had inherited a theological controversy about the relationship between deity and humanity in the person of Jesus Christ. In an occurrence that was not uncommon for the time, the doctrinal issue became entangled with personal and political rivalries. Flavian's stand for orthodoxy gave his high-ranking court opponents a chance to act against him by encouraging the proponents of doctrinal error and manipulating the emperor in their favor. The theological issue had arisen after the Council of Ephesus, which in 431 had confirmed the personal unity of Christ and condemned the error (known as Nestorianism) that said he was a composite being made up of a divine person and a human person. But questions persisted: Were Jesus' eternal divinity, and his assumed humanity, two distinct and complete natures fully united in one person? Or did the person of Christ have only one hybrid nature, made up in some manner of both humanity and divinity? During Flavian’s patriarchate, however, the doctrine of Christ’s two natures had not been fully and explicitly defined. Thus, controversy came up regarding the doctrine of a monk named Eutyches, who insisted that Christ had only “one nature.” Flavian understood the “monophysite” doctrine as contrary to faith in Christ’s full humanity, and he condemned it at a local council in November of 448. He excommunicated Eutyches, and sent his decision to Pope Leo, who gave his approval in May 449. Chrysaphius, who knew Eutyches personally, proceeded to use the monk as his instrument against the patriarch who had angered him. He convinced the emperor that a Church council should be convened to consider Eutyches’ doctrine again. The resulting council, held in August 449 and led by Dioscorus of Alexandria, was completely illegitimate, and later formally condemned. But it pronounced against Flavian and declared him deposed from the patriarchate. During this same illicit gathering, known to history as the “Robber Council,” a mob of monks beat St. Flavian so aggressively that he died from his injuries three days later. Chrysaphius seemed, for the moment, to have triumphed over the patriarch. But the state official’s ambitions soon collapsed. Chrysaphius fell out of favor with Theodosius II shortly before the emperor’s death in July 450, and he was executed early in the reign of his successor Marcian. St. Flavian, meanwhile, was canonized by the Fourth Ecumenical Council in 451. Its participants gave strong acclamation to the “Tome of Leo” – in which the Pope confirmed St. Flavian’s condemnation of Eutyches and affirmed the truth about Christ’s two natures, both divine and human.